The Universal Audio Apollo Twin USB raises the bar of desktop recording by delivering incredible analog studio sound, feel, and flow for music creators everywhere to embrace. This 2x6 USB 3 audio interface for Windows-based machines combines the peerless 24/192 kHz audio conversion of Universal Audio's acclaimed Apollo series with on-board Realtime UAD Processing and Unison technology - a breakthrough in classic mic preamp emulation. Complete with onboard UAD-2 DUO Core processing the Apollo Twin USB means you can record your music in real time (at sub 2ms, near-zero latency) through the full range of UAD plug-ins that are available from Neve, Studer, Manley, Marshall, Lexicon, API and more, putting racks of vintage EQs, compressors, mic preamps, tape machines, reverbs, and guitar amps at your disposal. A Universal Audio breakthrough, Apollo Twin USB's Unison technology gives you the tone of the world's most sought-after mic preamps — including their impedance, gain stage “sweet spots,” and component-level circuit behaviors. Based on unprecedented hardware-software integration between Apollo’s mic preamps and its on-board UAD plug-in processing, Unison lets you record through stunning emulations like the bundled UA 610-B Tube Preamp & EQ plug-in, with more emulations available at the UA Online Store. 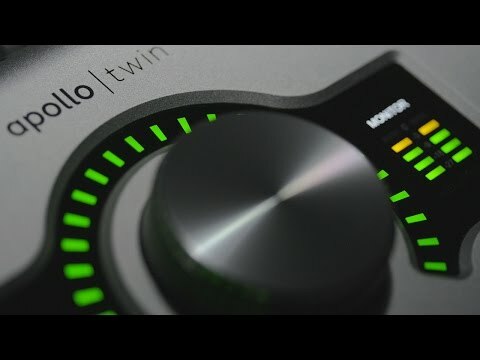 Apollo Twin USB’s smart feature set includes two class-leading mic/line preamps, two analog line outputs, two digitally-controlled analog monitor outputs for full resolution at all sound pressure levels, and up to eight additional channels of digital input via Optical connection. Its onboard UAD-2 DUO Core processing lets you use UAD plug-ins both during real-time tracking and for mixing within Pro Tools, Cubase, Live, and more. With its stylish and ergonomic desktop design, rugged and sleek aluminium construction, front panel headphone and instrument connections, the Universal Audio Apollo Twin USB has all the right tools for you to create music of majestic quality. With the Apollo Twin USB Desktop Interface you'll also receive the Real-time Analog Classics plug-in bundle containing some legendary compressors, stunning guitar and bass amp emulation as well as pre-amps and EQ's.